Regent Seven Seas Alaska Cruises in 2015. These Luxury All Inclusive Alaska Cruises could be the perfect way to visit and explore Alaska's amazing coastline without all the fuss found in lesser itineraries. Regent cruise specials and their last minute cruise deals for 2015 include the cruise dates listed below. These popular dates will not last at these low prices on all-inclusive Alaska cruises. 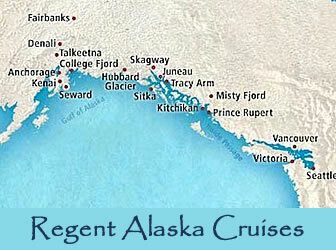 9 Days Alaska Cruises sailing from San Francisco; Regent Alaska Cruises 2015. Regent offers these all-inclusive luxury Alaska cruises onboard their luxurious Regent Seven Seas Navigator sailing from Seward Alaska in 2015. The all inclusive prices includes you passage, shore excursions, transportation and even complimentary services to Anchorage and Seward.